“Pillars of Peace Hawaii: Building Peace on a Foundation of Aloha” was launched by the Hawaii Community Foundation in April 2012. We hope to inspire people--from keiki (children) to kupuna (elders)--to cultivate compassion, mindfulness and justice in their daily lives; to better understand the roles of compassion, diversity and culture in the practice of peace; and to grow ethical and compassionate leaders for Hawaii’s future. Pillars of Peace Hawai‘i began with a series of visits by prominent world peace leaders including His Holiness the Dalai Lama and Archbishop Desmond Tutu. 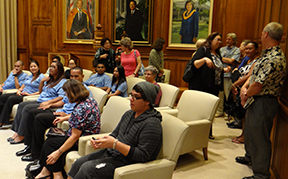 Their visits offered the remarkable opportunity to impart lessons from Hawaii about practicing peace and aloha in our daily lives, while absorbing the wisdom these leaders shared from their own cultures and experiences. To expand our vision and more effectively reach Hawaii’s youth, Pillars of Peace Hawaii supports the social and emotional health of students and educators with a strategy based on three key actions – Demonstrate, Communicate and Influence – to ensure wide spread integration and implementation of social and emotional learning (SEL) in Hawaii schools. Eleven Hawaii schools are part of a multi-year SEL pilot effort to demonstrate and gain best practices around SEL implementation and the Roots of Empathy program is supported in 15 schools. These school partners are sharing their lessons learned with other schools through community meetings, professional development opportunities, and the Schools of the Future Conference which now includes a track of speakers and presenters on SEL and attracts over 2000 educators each year. 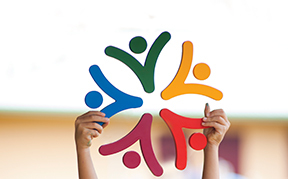 Applications from Hawai‘i schools serving students from preschool through 6th grade are being considered for the Sanford Harmony Program under the Hawai‘i Community Foundation’s Pillars of Peace Hawai‘i initiative. Up to 15 schools will be considered for this first year. Interested in getting involved with the Pillars of Peace Hawaii?